Photos can have a strong inspirational affect on us. They can freeze a moment of time when we experienced inspiration. They can take us to inspiring places we may not have been. They capture a mood that can be re-experienced every time we look at the picture. All the pictures I feature on this site are from my own collection. Some were taken on vacations and business trips. Others were taken in my own back yard or near our home in Wisconsin. Here are some picture I have featured in the past and how I have found inspiration from them. They are a bit larger in this post than I usually post them, so load times may be a bit longer than usual. Flowing water has always inspired me. Water is such an amazing substance. It unquestioningly embraces anything it comes in contact with. It flows without resistance. Yet given time, it is powerful enough to sculpt breathtaking landscapes, canyon, valleys and even plains. 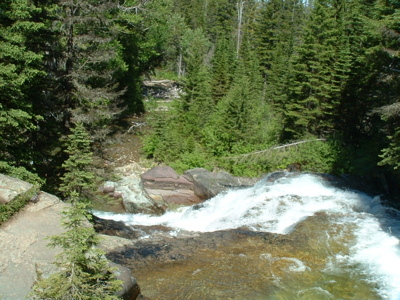 Flowing water also produces a sound that can put me in a meditative state effortlessly. I always feel close to God when I spend a significant amount of time exposed to the sound of rushing water. Especially in a natural environment where there are few other sounds. 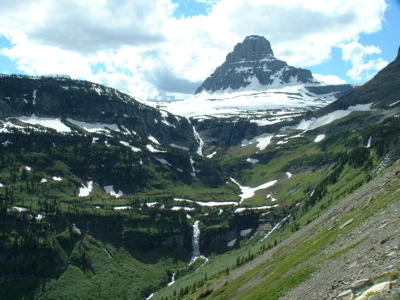 The picture above was taken on vacation at Glacier National Park: one of the most beautiful places I have every been. Another great scene at Glacier National Park along the Going-to-the-Sun Road. Seeing something so large and beautiful just drain stress from my body. Everything in my life within my realm of worry looks so small at the foot of this mountain. As I wake in the morning, and the fog lifts from my sleepy mind, watching the sun come up and clear the darkness and burn away the fog makes me feel as if the Earth is waking up with me. I am in tune with sun. There is a transforming power in a sunrise that lasts throughout the day. This picture was taken at Carney Lake. 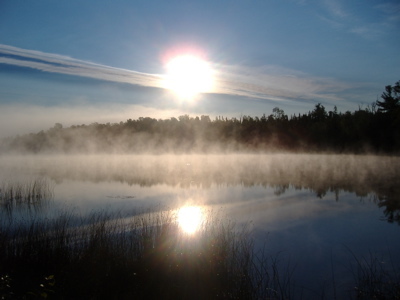 A rustic state park in Michigan’s upper peninsula. This is about 2 hours north of where I live and about 5 miles down a dirt road a few miles from where my parents live. I feel fortunate to be so close to such places. I have always loved long goodbyes. Watching a sunset is like experiencing the day’s long goodbye. Savoring the last moments of light and brilliant color as the night slowly and patiently take over the landscape with shadows. You might recognize this one as my header image. 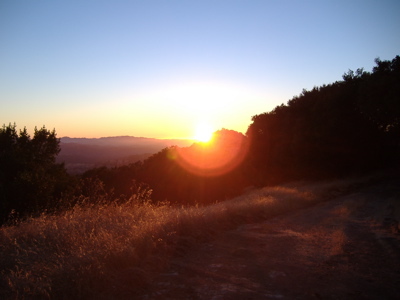 It was taken at Mount Diablo State Park near the San Fransisco Bay area. I took this while on a business trip. The bay area is rich with beautiful wilderness sites. There are so many more I could post, but I have to stop somewhere. I may make this a regular feature. Please share comments on some of your favorite photos. Feel free to include links to photos you have posted elsewhere. I would even be happy to post photos you email to me along with your commentary.